A team of astronomers using ground-based telescopes in Hawaii, California, and Arizona recently discovered a planetary system orbiting a nearby star that is only 54 light-years away. All three planets orbit their star at a distance closer than Mercury orbits the sun, completing their orbits in just 5, 15, and 24 days. Astronomers from the University of Hawaii at Manoa, the University of California, Berkeley, the University of California Observatories, and Tennessee State University found the planets using measurements from the Automated Planet Finder (APF) Telescope at Lick Observatory in California, the W. M. Keck Observatory on Maunakea, Hawaii, and the Automatic Photometric Telescope (APT) at Fairborn Observatory in Arizona. The team discovered the new planets by detecting the wobble of the star HD 7924 as the planets orbited and pulled on the star gravitationally. APF and Keck Observatory traced out the planets’ orbits over many years using the Doppler technique that has successfully found hundreds of mostly larger planets orbiting nearby stars. APT made crucial measurements of the brightness of HD 7924 to assure the validity of the planet discoveries. Artist’s impression of a view from the HD 7924 planetary system looking back toward our sun, which would be easily visible to the naked eye. Since HD 7924 is in our northern sky, an observer looking back at the sun would see objects like the Southern Cross and the Magellanic Clouds close to our sun in their sky. Art by Karen Teramura & BJ Fulton, UH IfA. The new APF facility offers a way to speed up the planet search. Planets can be discovered and their orbits traced much more quickly because APF is a dedicated facility that robotically searches for planets every clear night. 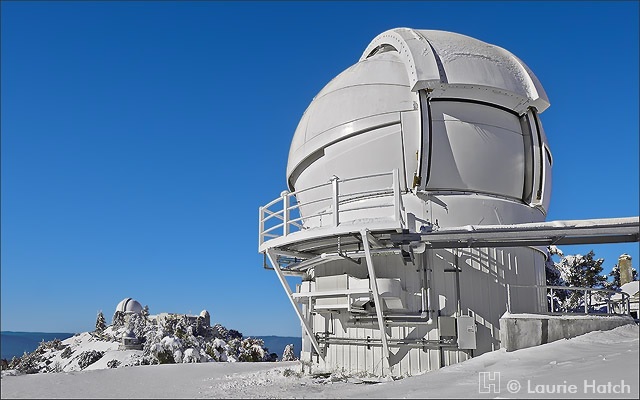 Training computers to run the observatory all night, without human oversight, took years of effort by the University of California Observatories staff and graduate students on the discovery team. “We initially used APF like a regular telescope, staying up all night searching star to star. But the idea of letting a computer take the graveyard shift was more appealing after months of little sleep. So we wrote software to replace ourselves with a robot,” said University of Hawaii graduate student BJ Fulton. The Keck Observatory found the first evidence of planets orbiting HD 7924, discovering the innermost planet in 2009 using the HIRES instrument installed on the 10-meter Keck I telescope. This same combination was also used to find other super-Earths orbiting nearby stars in planet searches led by UH astronomer Andrew Howard and UC Berkeley Professor Geoffrey Marcy. It took five years of additional observations at Keck Observatory and the year-and-a-half campaign by the APF Telescope to find the two additional planets orbiting HD 7924. The Kepler Space Telescope has discovered thousands of extrasolar planets and demonstrated that they are common in our Milky Way galaxy. However, nearly all of these planets are far from our solar system. Most nearby stars have not been thoroughly searched for the small “super-Earth” planets (larger than Earth but smaller than Neptune) that Kepler found in great abundance. This discovery shows the type of planetary system that astronomers expect to find around many nearby stars in the coming years. “The three planets are unlike anything in our solar system, with masses 7-8 times the mass of Earth and orbits that take them very close to their host star,” explains UC Berkeley graduate student Lauren Weiss. Observations by APF, APT, and Keck Observatory helped verify the planets and rule out other explanations. “Starspots, like sunspots on the sun, can momentarily mimic the signatures of small planets. Repeated observations over many years allowed us to separate the starspot signals from the signatures of these new planets,” explains Evan Sinukoff, a UH graduate student who contributed to the discovery. The robotic observations of HD 7924 are the start of a systematic survey for super-Earth planets orbiting nearby stars. Fulton will lead this two-year search with the APF as part of his research for his doctoral dissertation. “When the survey is complete we will have a census of small planets orbiting sun-like stars within approximately 100 light-years of Earth,” says Fulton. Telescope automation is relatively new to astronomy, and UH astronomers are building two forefront facilities. 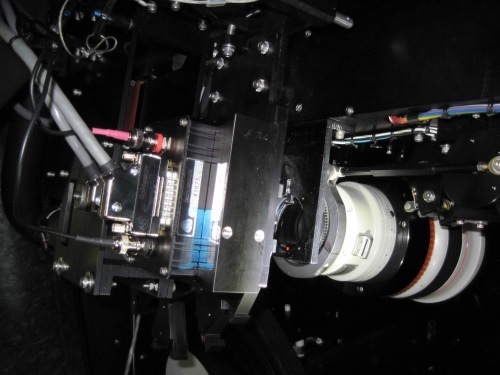 Christoph Baranec built the Robo-AO observatory to takes high-resolution images using a laser to remove the blur of Earth’s atmosphere, and John Tonry is developing ATLAS, a robotic observatory that will hunt for killer asteroids. The paper presenting this work, “Three super-Earths orbiting HD 7924,” has been accepted for publication in the Astrophysical Journal and is available at no cost at http://arxiv.org/abs/1504.06629. The other authors of the paper are Howard Isaacson (UC Berkeley), Gregory Henry (TSU), and Bradford Holden and Robert I. Kibrick (UCO). n honor of the donations of Gloria and Ken Levy that helped facilitate the construction of the Levy spectrograph on APF and supported Lauren Weiss, the team has informally named the HD 7924 system the “Levy Planetary System.” The team also acknowledges the support of NASA, the U.S. Naval Observatory, and the University of California for its support of Lick Observatory.